Any DVD Cloner Platinum is a powerful combination of DVD cloner and DVD ripper. As a DVD cloner, it provides 4 flexible copying modes to copy, clone or compress DVD to DVD, DVD folder or ISO image with all protections decrypted and removed. As a DVD ripper, it can rip any DVD to MP4, MKV, and M4V as well as rip DVD to MP4 videos for iPod, iPhone, PSP, PS3, Xbox 360, etc. 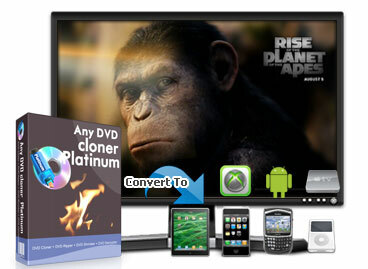 Get our Special Offer - Any DVD Converter + Any DVD Cloner Platinum Bundle for only $59.95! DVD Convert and Ultimate DVD Clone Solution Suite for encrypted DVD movies with the lowest price is offered to you! 30 USD is saved if you order now! Support downloading online videos and convert them to MP4, AVI, MP3 etc.